New Year resolutions often integrate improving our health. 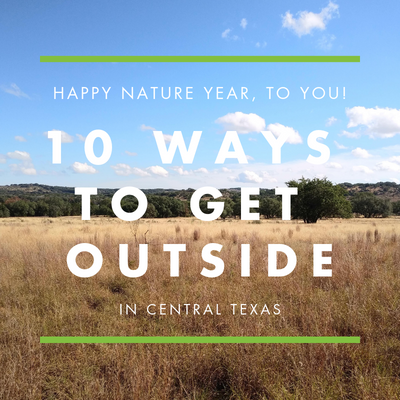 With the richness of nature in Central Texas, we put together a list of ideas where you can shift ordinary routines to outdoor adventures. 1. Move your coffee date with a friend to a walking date around Lady Bird Lake. 2. Plan for a weekend hike with the family to re-connect with nature… and with yourself. Bring pencil and paper to sketch the journey. 3. Picnic in a city, county, or state park. Leave it better than you found it by bringing an extra trash bag. 4. Replace the Saturday morning cartoon time by setting up a bird feeder and watching with your kids. Take pictures to help identify the birds. 6. Lie outside in a hammock or on a blanket and observe the shapes of the clouds. 7. Arrange for your work’s Staff Development Day to be in a nature-rich environment, like the Warren Skaaren Environmental Learning Center at Westcave Preserve. 8. Beat the summer heat! Explore the underground world of Central Texas caves: Inner Space Caverns, Longhorn Cavern State Park, Natural Bridge Caverns, Westcave Preserve, or Cave Without a Name. 9. Volunteer at a local nature preserve for a fun, heart-filled family day, like at one of Westcave’s Conservation Volunteer Days. Bonus: Be mindful of the nature near you every day.